There is a certain passion and joy that goes into documenting, or identifying a vintage drum, especially one manufactured by Ludwig. It tells a story, not only in what it is, but where it's been; the roads traveled, its relevance to drum manufacturing, and its influence on music. Dating Ludwig Drum products can be rather easy or quite tedious. In reality, the early days of drum manufacturing held no regard for dating or serializing a product for chronological relevance. A future significance in chronologically cataloging a product produced by Ludwig wasn't foreseen. Luckily, there have been devotees that have developed a refined system to dating and cataloging drums produced by Ludwig. This section exists as a guide to identifying and dating, Ludwig drums produced in the 1960’s. It is heavily concentrated on factors that were included on all cataloged trap kits, and wood drums of this era. There are several ways to date Ludwig drums from all production periods. The most accurate way to dating a drum is to see it as a whole, and assess every aspect of the drum. Indicating factors include (not limited to): serial numbers, date stamps, shell mold, shell hardware, finishes, and badges. 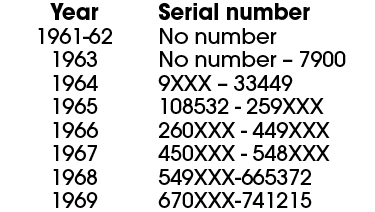 Serial numbers don’t directly identify specific drum type or year. 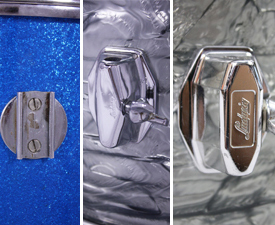 In fact, it wasn’t until 1964 that Ludwig started to put serial numbers on their products. That leaves 4 years of 60’s era drums that can’t be dated using a serial number guide. The boom in production, along with new government regulations, prompted Ludwig to begin issuing serial numbers on badges of their drums. The new regulation would later make it easier to date and catalog Ludwig drums, but it came with a price of extensive time and effort. Serial numbers are subject to discrepancies, which is why it is important to assess all aspects of the drums listed on this page not only to date the drum, but do determine the originality of it. This era would also mark the end of the Keystone badge era. Date stamps are the most accurate indicator to when the drum was formed, however not completed. Unfortunately, more often times, the number does not exist or has worn away. Date stamps were done on the inside of a drum shell with a abbreviation of the month, followed by the day, and then year. Date stamps for drums produced in 1960-1963 were strictly red ink, while date stamps from 1964-1969 were red or black. The discrepancy between date stamps and serial number on badges exists because the stamp was put on the shell during the first half of the production process. Drum shells were formed and then stored in stock until pulled for final assembly. Once in final assembly, badges were then issue to the shell that was pulled for final assembly. The Ludwig Shell molds from 1960-1967 were 3-ply mahogany/poplar/mahogany shell with 1” solid reinforcement rings. The interior of the shell was clear in 1960, and by 1961 all shells were white up until 1967. By then, the shell mold changed from using a mix of mahogany and poplar to using maple and poplar in the same style 3-ply mold. The first tom bracket on 1960’s Ludwig drums was the diamond bracket. The diamond shaped chrome bracket was designed with a slot to slide on the extension arm of the sliding rail. This bracket was replaced around 1962 with the first generation Ludwig script logo bracket. First Generation Ludwig Script logo Brackets appeared from 1962 until early half of 1965. It was a smoother contoured looking bracket. The bracket was designed with a threaded housing tapped on the bracket itself, allowing for a wing head bolt to be fastened in potion onto the L-Rod. Mid 1965 saw the rise of a second generation Ludwig script logo bracket. These brackets were designed with a more boxed hard edge look, with an internal eyelet bolt needing a wing nut to fasten the bracket to the support rod. It was continuously used in to the 70's on most catalogued outfits. Another existing tom bracket of the 1960’s was the round slide mount. This mount was configured on Hollywood and Blue Note outfits up until early 1965. It was then replaced by second generation Ludwig script bracket. Ludwig drums had mufflers installed on all drum but the bass drum. First era mufflers are known as the “baseball bat” mufflers since the rod that made the muffler active on/off was the shape of a baseball bat. The internal component that was the muffler was a rectangular 2” or so felt pad. This also changed form throughout the 60’s. The first generation muffler had red felt and existed until around 1965. From then on, the felt pad was white. By 1968, Ludwig introduced the round muffler pad installed directly adjacent to the badge on a drum. Ludwig used varying bass drum mounts and rail mounts that coincide with the change of the shell mounting brackets on tom toms or floor toms. First generation rail-consolette catered to the diamond bracket mount. The second-generation rail mount was used when the first generation Ludwig script mounting bracket was introduced in ‘63. By ‘67, the third generation rail mount with adjusted locking teeth at the joint was introduced, coinciding with the second generation Ludwig script mount that was introduced in ‘66. Ludwig bass drums that complimented a double tom post was fixed onto the P1610D bass casting. This bass casting would change form at around 1966. Bass drum spurs were also another drum shell hardware component that saw a dramatic change on Ludwig kits throughout the 60’s. Telescoping spurs were apparent on bass drums from 1960 - 1962. By 1963, the gull wing spurs were introduced with two variations including either first generation Ludwig script bracket or second generation Ludwig script bracket. Bass drum spurs found there final change of the decade in 1968 with the introduction of the first generation 5/16” curved spur, carrying well into most of the 1970’s. In the end, all of the changes and variations of Ludwig drums translate to a chronological progression, while depicting growth and advancement in design. Ludwig Drum Co. really benefited from the response their products had received. By the end of the 1960’s, Ludwig Drum Co. wanted it to be apparent that change and progress forward were to come. The change of the Ludwig logo, from the script to the stricter square logo, was a sort of foreshadowing of just that. 1968 saw the rise of a new logo and yet the coming rise of another decade owned by Ludwig innovation. This time headed by William Ludwig II.